I wrote on Tuesday that Bro. 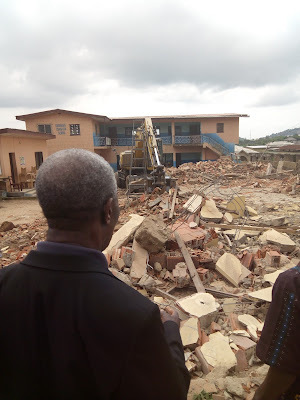 Shobanke is going to have to rebuild one of his branch churches in Abeokuta, Ogun State, Nigeria. They had to tear it down because it was about to fall down and hurt someone and possibly destroy their school building. It was a tough thing to do but had to be done. I have had a few folks ask how they can contribute. That is a good question. It is notoriously hard to get money safely wired to Nigeria. It has been done by people I know but it is risky. I also know people that have wired money through reputable companies and it was never delivered. Some of them eventually got their money back and some did not. I refuse to take that chance at this point. After the second person asked me about contributing, I remembered that a good friend of mine will be leaving soon for Nigeria. I contacted him yesterday and he is willing to deliver whatever offering we can gather for Bro. Shobanke. I must mail him a check on Tuesday August 22nd in order for him to receive it in time to process it and take it with him. Today is Friday. If you want to help with the expense of rebuilding the church that was torn down, there are two ways to do it. 1. You can put a check in the mail to Boggs Family Ministries (Address below) and then let us know how much is on the way. 2. Or you can give through the Donate button on this website. Whether you send a check or Donate through the website, please let us know it is for the "Nigerian Church". I assure you that 100% of the money will go specifically for that purpose. We will keep none of it and my friend that delivers it will keep none of the money. Also, Bro. Shobanke is always very diligent about accounting for every penny we give him for a project. I assure you that he will make sure that the money is spent properly for the church rebuild. Please do not feel pressured to give, that is not my intention to at all. Many of you have commitments that are pressing and more opportunities to give than you can fulfill. Help if you need to, want to and can do it. Whatever you do, please pray for Bro. Shobanke, his Pastors and his people. May God bless you. Thank you for reading today.